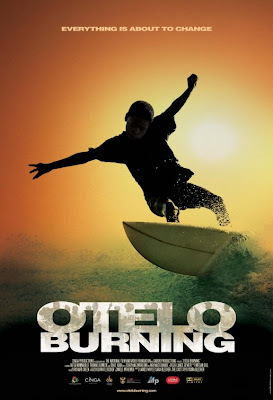 Otelo Burning, a coming-of-age film about a group of young township kids who discover the joy of surfing, opens in cinemas countrywide on 11 May 2012, this coming Friday. 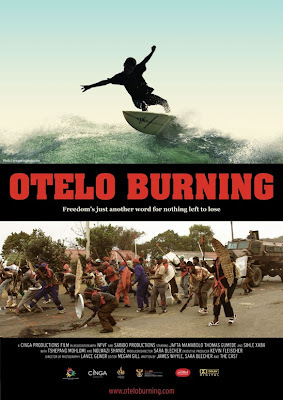 Shot in Durban and directed by Sara Blecher (Surfing Soweto), the film is set in 1989 against a backdrop of brewing conflict between two political groups in Lamontville, KwaZulu Natal. The story starts when 16-year-old Otelo Buthelezi, his younger brother Ntwe and his best friend New Year are invited to the beach-house where their new friend’s mother is a domestic worker. They watch Mandla Modise surf and he takes the boys into a world previously closed to them. For the boys, who had a deep-seated fear of the sea, “flying on water” comes to represent freedom, and they are sold. Soon, everyone recognises that Otelo is truly gifted on the water, a surfing star in the making. But jealousy, betrayal and political turbulence impact the lives of these young boys in ways that will change them forever. The film is in isiZulu with English subtitles and stars a new generation of exciting, hugely talented young actors including Jafta Mamabolo (Generations), Thomas Gumede (A Place Called Home), and Tshepang Mohlomi (Izulu Lami). “This is a beautifully made, insightful and entertaining film that captures a turbulent time in the history of South Africa, as well as the tension between success and justice,” says Helen Kuun, CEO of Indigenous Film Distribution, which is the distributor of the film in South Africa. In the lead is Mamabolo who is best known for his role as the young Kunene in the 2008 feature film Jerusalema, and for his role as Thapelo in the third and fourth seasons of the SABC1 youth drama series Soul Buddyz. In the role of New Year is Thomas Gumede, an actor and comedian best known for his role as Siphiwe in the SABC 1 drama series A Place Called Home. He is also known for being the co-host of the SABC 1 youth talk show The Cypher. He is currently appearing in the new reality show Forever Young, which will be on Vuzu. Tshepang Mohlomi plays Ntwe. He is known for his portrayal of the street urchin Chili-Bite in Izulu Lami/My Secret Sky, a role for which he was awarded the Best Supporting Actor prize at the 2010 South African Film & Television Awards (SAFTAs), and the award for best child actor at 2011’s African Academy Awards held in Nigeria. Sihle Xaba takes on the role of experienced surfer Mandla Modise. In real life Xaba is a South African champion body boarder and a surfer who was the lead actor in the SAFTA award-winning drama series Bay of Plenty. He is also an eThekwini Municipality lifeguard. Otelo Burning is to an extent based on Sihle’s own real-life experiences. Award winning documentary director and producer Sara Blecher executive produced and directed Bay of Plenty, a SAFTA winning 26-part drama series for SABC 1. It was largely based on research and work she’d done over the years with the lifeguards and surfers on the Durban beachfront. In 2011 she released Surfing Soweto, a documentary following the lives (and deaths) of a group of so-called ‘train surfers’ in South Africa. 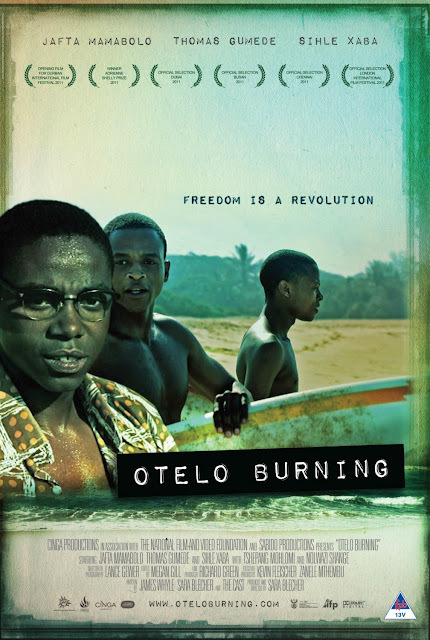 Make sure you check out Otelo Burning this weekend.